Plastic SCM blog: Method history for Subversion is here! Method history for Subversion is here! Simply put: right click on a C# method in Visual Studio and find its history instead the entire file history: we called it method history for SVN!! This command launches a window that displays the most recent revisions of the file containing the method. 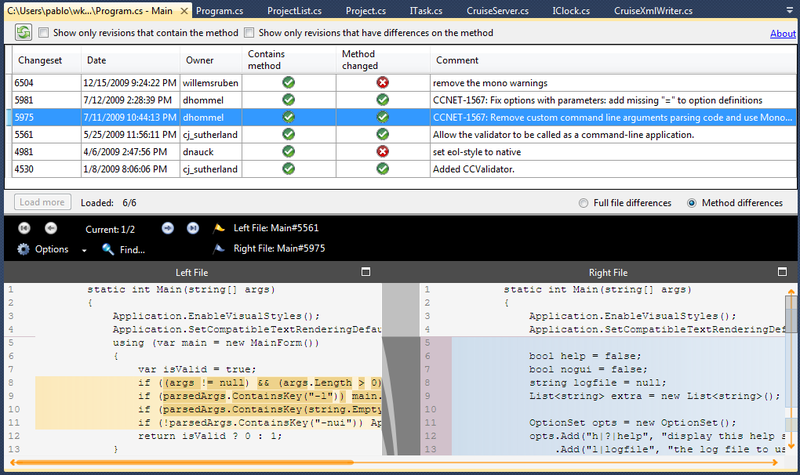 Then you will be able to navigate the different revisions and be able to filter the ones that contain the method and the ones where the method has been modified. It doesn’t matter how heavily you refactored your code, the plugin will locate it! Download the plugin here. 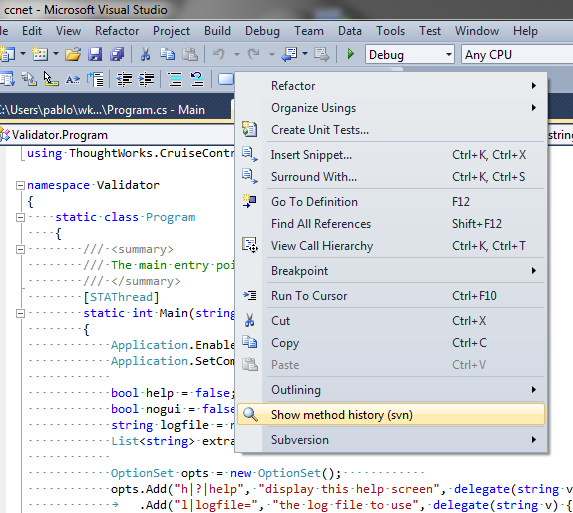 It installs in just a few seconds and then a new menu option will show up on your context menu on Visual Studio. Testing it can’t be easier. 95% of the time you check the history of a file you’re looking for the changes you’ve done to a given method, aren’t you? Then you have to diff the files and locate the method yourself. It becomes a real nightmare if the method has been moved around in the file or if it has been heavily refactored. We developed “method history” as part of our Plastic SCM version control system. Now we’re sharing it with Subversion users to enhance their day to day operations and also introduce them to our technology. “Method history for Subversion” is still in beta so we really appreciate feedback through our forum (http://www.plasticscm.net). Right now it only works for C# code, but we will be adding Visual Basic and Java support soon. Add support for VB and Java and later C++. Improve current C# support (it doesn’t work for properties yet). Improving method search (being able to track renamed methods). Very excited to use this tool, it looks great. Unfortunately, I am getting an "Object reference not set to an instance of an object" error in both Visual Studio 2008 and Visual Studio 2010 on both Win XP 32 and Win 7 64.